Shrubby Cinquefoil is a small, deciduous flowering shrub. This hardy species is densely covered with leaves and produces pale to bright yellow buttercup-shaped flowers terminally on the stems. Flowering typically occurs from early to late summer. 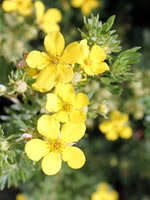 Shrubby Cinquefoil is a popular ornamental shrub choice and is capable of growing on a variety of sites.